Oct. 2, 2018 - The development of TRC's 880 Crown & Chassis Extreme began with a need. Canadians needed a grease that offered all the great qualities of our 880 Crown & Chassis plus functionality in the cold of winter and heat of the summer. 880 Crown & Chassis Extreme is that grease. It is formulated for year-round use, maintaining the consistency of a NLGI 2 grease. But it will pump like a NLGI 00 grease at –40°C, while providing the high level performance and protection expected from a TRC product. 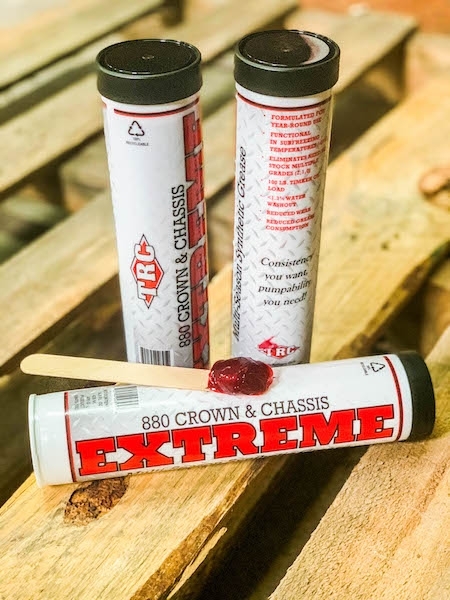 880 Crown & Chassis Extreme is designed and tested to lubricate efficiently from -40°C up to 130°C, while maintaining an industry best 100 lb. Timken OK Load. Water resistant with less than 1.3 per cent washout, it also eliminates the need to stock multiple grades (2, 1, 0), thereby reducing greasing intervals, labour costs, and grease consumption.